I'm not exactly sure why, but this somehow looks like a shirt that women are far more likely to wear than men. (The missus confirms that.) Maybe the purported tendency of women to be more invested in Standard Language Ideology? I'm way too old to remember the days of being single, when social settings were opportunities to meet potential romantic interests. (John Cowan makes appropriate guesses about my age in a comment here.) But this is the exceptional case where I would have taken motherly advice about such matters very seriously. Perhaps the gendered nature of the shirt is due to the increased likelihood of women to be English teachers? 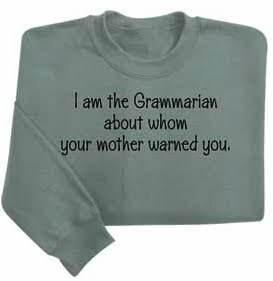 "Hi, my grammar conforms better to an arbitrary standard than does yours - NYAH!" is not a message I generally want to send. As a former English teacher, however, I would have gleefully worn that shirt to class. And my students would have pointed out that there's no good reason for "grammarian" to be capitalized. And we'd have all had a good laugh. Thanks to both of you. Yeah, the cap is funky for sure. But it fits the mindset, right? I blame the font. This is a job for Times New Roman. Good point ... the font is part of it for me too, I think.